Dr. Zhaoqing Yang is a Chief Scientist at the Marine Sciences Laboratory of the Department of Energy's Pacific Northwest National Laboratory (PNNL). His research covers broad areas in estuarine and coastal modeling and analysis, including marine renewable energy, hydrodynamic and transport processes, effects of storm surge and anthropogenic disturbances on coastal infrastructure and ecosystems, and coastal carbon cycle. Dr. Yang's recent research interests primarily focus on two areas: (1) resource assessment of marine and hydrokinetic energy; and (2) modeling the impacts of natural disasters, climate change and human activities on coastal zones using an integrated modeling approach. 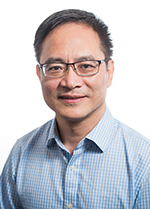 Dr. Yang leads PNNL's modeling effort on resource characterization and environmental impacts of tidal-stream and wave energy development, and the effects of storm surge and sea level rise on coastal infrastructure and ecosystems. He is the lead modeler for PNNL's high resolution hydrodynamic and transport model of Puget Sound. Dr. Yang has conducted many modeling studies related to tidal dynamics, estuarine circulation, and nearshore wetland restoration in Puget Sound using integrated modeling approach. He has extensive experience in wave dynamics, sediment fate and transport, and water quality modeling. Khangaonkar T.P., Z. Yang, C. DeGasperi, and K. Marshall. 2005. "Modeling Hydrothermal Response of a Reservoir to Modifications at a High-Head Dam." Water International 30, no. 3:378-388. PNWD-SA-7113.